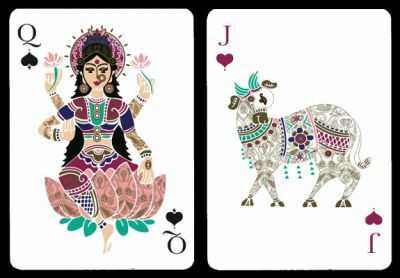 The Divine Art Playing Cards project combines playing cards with Hindu Mythology. Sunish Chabba is an Australian management consultant and playing cards enthusiast. With Anaya Purandare & Anjali D'Souza, he designed this pack from traditional wood block and patterns inspired from Mehndi. The court cards show various gods (kings), goddesses ( queens) and their mounts (jacks). The pip motifs are also inspired by traditional Indian art. Note that the players cannot use those cards to gamble with money. This is a limited edition of 500 packs with gilded edges and a numbered stamp.